Step 1: Mix the quick set cement with water in your container, following the instructions on the box. The mixture should be workable for about 5 mins so stir until as smooth as possible and quickly pour or spoon into the silicone moulds. Tap on a flat surface a few times to remove any air bubbles. Step 2: Then lodge your candle sticks in, far enough without reaching the bottom. You can also do the same with tea lights if your prefer that idea. It won’t take long before you no longer need to hold them in place. Step 3: Leave to set completely and then gently twist your candles out. If you’re worried about them sticking you can spray the bottoms of the candles with cooking spray before inserting them. 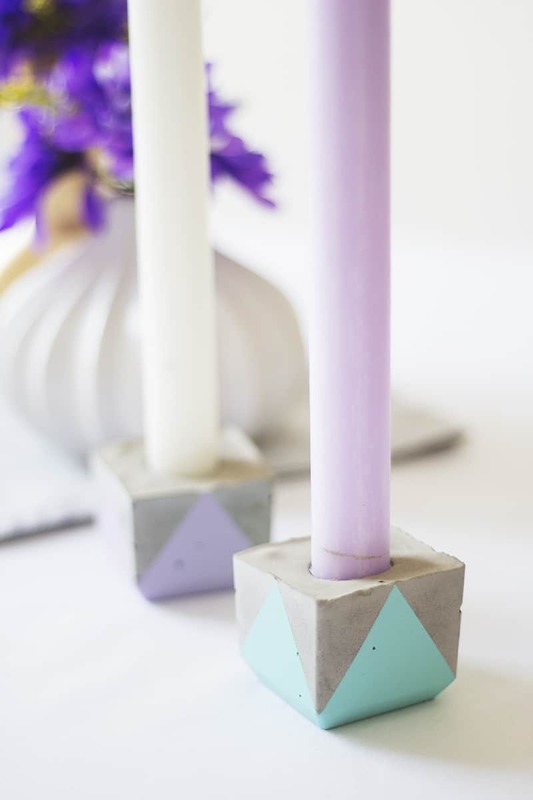 If you remove the candles before the concrete is fully set then there’s a risk of cracking. Step 4: Now you can mask off your pattern for painting. Use the washi or masking tape to protect the areas you don’t want to be coloured. Step 5: Brush on the colour to give thick, even coverage. Step 6: Once dry remove the tape to reveal your pretty pattern and fill them with a candle stick each. You may need to shave a little off the bottom of the candlesticks to fit them back in . Thank you so much for sharing this DIY with us today Teri! If you haven’t happened across The Lovely Drawer yet, then get on over there and have a gander! Not only is her blog super inspirational, but the Etsy store is full of the prints and stationery perfect for our lovely brides looking for something more unique! We look forward to welcoming Teri back again soon! What kind of cement did you use? Is it Ardex or something else?